Dogs are ever curious — second only to exploring with their noses, they use their mouths to investigate new and interesting things. Dogs can choke on just about anything that is the size of the opening to the trachea, but the most common offenders are small balls, such as golf and squash balls, rawhide and real bones, cellophane, and children’s plastic toys. A choking dog makes retching motions and will look panicked, often pacing back and forth and pawing at her mouth. Her chest may be heaving but she isn’t making any airway noises. For a large dog: Stand behind your dog and place your arms around his body. Make a fist with one hand, and place the thumb of that hand against your dog’s abdomen just where the sternum ends. 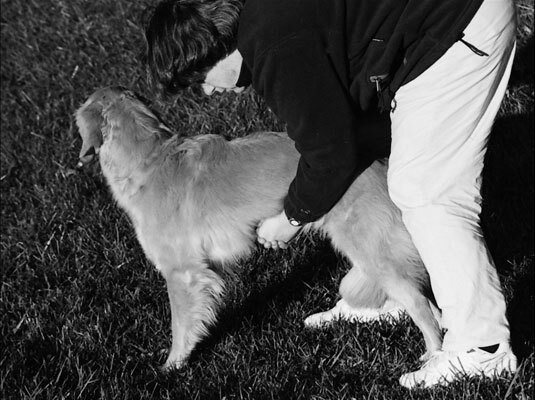 With the other hand, grasp your fist and push upward and forward (toward the dog’s shoulders), suddenly and forcefully. Do this thrusting motion four or five times. Check the dog’s airway again and clear any debris from the mouth. Repeat the chest thrusts if necessary. If the dog is unconscious, clear the airway and perform rescue breathing. 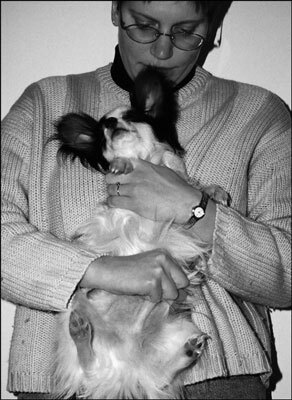 For a small dog: Hold the dog with her head up so that her spine is against your chest. Make a fist with one hand, and place it against your dog’s abdomen just where the sternum ends. Grasp the fist with your other hand, and give four or five rapid thrusts inward and upward. Check the dog’s airway again and clear any debris from the mouth. Repeat the chest thrusts if necessary. If the dog is unconscious, clear the airway and perform rescue breathing.